The increased pace of automation is one of the major reasons as to why safety managers are facing difficulties in ensuring machine safety. Processes have become more complicated, while corporations are always looking to cut costs through automation that requires a thorough safety system for all industrial entities. 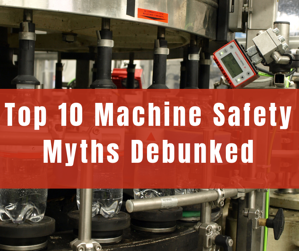 Here are some common misconceptions that plant managers may hold regarding machine guarding that’s making their job more complex and putting workers’ safety at risk. Several plant managers are under the impression that safety protocols need to be established only once, and then forgotten. In reality, it’s the opposite. Safety is an ongoing requirement for a plant and must be thought of as an evolutionary process. As companies expand their production capabilities, bringing in greater resources, fresh assessments need to be performed to ensure their safety. In addition to this, safety standards are becoming stringent with every passing day, which illicit the need for constant design change. Hiring an assessment service provider is the easiest way to get a comprehensive check-up of the current state of affairs. One of the first thing plant managers should look for in an assessment service provider is team composition. The team should consist of experienced professionals and engineers rather than salesmen, period. The service provider must hold a deep understanding of the ongoing developments in the industrial landscape and hold industry certifications to strengthen their case. If the budget allows, the potential candidate should also offer professional liability insurance for their services. Solid engineering design forms the basis of machine safety. If you think that having a comprehensive employee training program in place can serve this purpose, then you’re wrong. On the contrary, this can increase the risk of employees getting in harm’s way. Surely, an effective training regimen is necessary, but it should be seen as a supplementation rather than the first line of defense. A machine-backed safety system possesses greater accuracy and reliability compared to the most trained of humans, as they are always capable of making mistakes. There are some exemptions under robot’s safety circuit integration that have led to the confusion that older machines can be “grandfathered in” and thus, don’t require safeguarding. This is not true. No equipment, no matter how clean its track record is, gets a free pass from modern machine safety standards. This confusion has led several conventional managers to believe that since the machine was designed at a time when guarding standards didn’t exist, the rules don’t apply to them. Following this path would only lead to violations and increase the risk of accidents. The same goes for new equipment, which unless explicitly stated, isn’t compliant with safety standards. When a government inspector sets foot on your plant floor, he/she doesn’t have to pass judgment on every single equipment. It is very much possible that he/she may miss a set of machines, but this doesn’t imply compliance. When another inspector arrives later on, he/she may point out non-compliances, leading to additional fines. Therefore, the best way to make sure this doesn’t happen is working with an inspection service provider beforehand so that all processes can be effectively safeguarded. There is a difference between standards and legislation. Legislation is considered law, and therefore, binding, but a standard is a guideline that demonstrates compliance with the former. A standard can’t be enforced by inspectors but inability to follow legislation can lead to actionable consequences. Interested in learning more, connect with an ACD expert!